Cheyechi shudhu shob kichute shunnota. All I want is nothingness. As he sings these lines in Obhiman, from the album 'Boka Manustha - Sumon o Aurthohin 2', one senses the remorse and anguish in his lyrics. In the third track in this album, Sumon speaks about how he is constantly trying to deny the all-worldly splendour of a moonlit nights, the glory of being on cloud nine and the feeling of victory in finally reaching the highest mountain peak. He asks why he cannot attain a state of vacuum, why he is being denied the beauty of solitude and why he cannot fathom a life between darkness and light. With heartfelt guitar work by Chintu, Obhiman touches the listener's heart with Sumon's earnest questions which he asks himself and those who will care to listen. Obhiman is probably one of Sumon's most poignant creations. After a considerable gap in his musical career due to health conditions, Sumon was trying to voice out the turmoil going on within him in this song and trying to figure out the aggravation seeping in. 'Boka Manushta -- Sumon o Aurthohin 2,' a G-series exclusive and sponsored by Acer, a computer brand, is a set of 17 numbers, which was released last February 13. He sings about love, passion, depression, and the unanswered questions in his life not to mention the constant miseries that he has to face in his every day life and the ways to come out of them. “This album is a musical journal of my life,” says Sumon. The album seems to symbolise the voice of just another human being in Bangladesh, trying to rinse out the negative energy from within. Many of the numbers are quite abstract, and the pathos may seem a bit overwhelming. However, this album echoes a feeling quite intangible yet extraordinary. To make this album all the more meaningful, Sumon worked with at least 35 musicians belonging to the current music scenario today. From big names like Kamal, Buno, Jewel, Shampa Reza, he worked with musicians such as Fuad, Jon, Tanvyr, Shifa, Imtiaz, Anila, Simin, Topu, Chintu and many more, including his eight-year-old son Ahnaf and three-year-old daughter Aurora. Listening to this album is like getting a fresh taste of the music scene, which is rocking the country today from households to tea stalls. Though the album did seem to define elements of subtle darkness, it did have compositions like Phul Gulo Shob Gelo Kothay to simply spice up your day. Listening to this song takes one through a roller coaster ride. One of the most popular numbers in the album, the song showcases several talented musicians, vocalists not to mention a mixture of style, class and approach. Tobuo, featuring Nabila, is a number which one could probably play for hours together and still not get tired of the sitar played on the Line 6 Variax along with Nabila's soothing vocal work. The spunky feel in Ghum Ashena was enriched much more with Anila's vocals, not to mention Simin's rich harmony in Bristy. Yet another song that attracted a lot of listeners was Ke, featuring Shampa Reza. Upon asking why he thought of featuring the eminent actress, Sumon simply said that he has admired Shampa from childhood and had wanted to work with her in one of his productions. It was indeed very refreshing to listen to Shampa's voice in yet another one of Sumon's touching numbers. Ke talks about a person going beyond the limit in his imagination and dreams about the impossible. 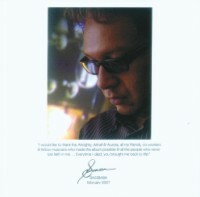 Many of the tracks were written on the spur of the moment by Sumon. For instance the title track Boka Manushta, the shortest in the album, is once again filled with abstract forms depicting the singer's fear of seeing his loved ones move away eventually and leave him in his loneliness. Initially, Porajoy seemed like a number which Sumon's fans and the general listeners would not comprehend. The song portrays his search for inner peace, his ability to overcome all challenges and rise once again to face the world in all its glory. This struggle finally became crystal clear as Jalal's flute work wove a path in between the song. Every musician has a style and a sound of his or her own. Sumon borrowed these sounds and flavours from his musician friends and blended them in his album. For instance, Shesh with Buno, Jhor with Fuad Al-muqtadir, Ditiyo Jibon, a duet by Topu (Yaatri) and Sumon had Topu's signature sound, not to mention Shohor with Arbovirus, Neer with Rajib (Stoic Bliss / Warfare) and Protigga with Tahsan. While Shohor leads one through a phase of nostalgia, with descriptions of familiar alleys, bricks and trees, not to mention the familiar people walking by in a city like Dhaka, Protigga is a patriotic composition referring to the confused state that the country is going through right now. Produced by Fuad Al-muqtadir, Jhor is a track which talks about breaking free from all the scruples in life and attaining freedom. The interesting part of this particular production is that one of Sumon's old hits, Amaar Protichobi was mixed in, where this time his eight-year old son Ahnaf was featured. In fact, his three-year old daughter Aurora was featured in his Ghumparani Gaan, a bedtime story which every father can share with his daughter. The album ended with Shesh, a production by Buno (Bangla) featuring Punam (Watson Brothers / Prayer Hall). The sounds of reality in this particular number and also the little things that matter make it one of the most enticing compositions in the album. Though a love song, it has a sad and an unconventional ending, just missing the 'thud' of a door banging close to complete the effect. Mixed by Jewel, Sumon, Buno, Fuad, Rafa, Rajib and mastered by Iqbal Asif Jewel, this conceptual album, cover designed by plan B and photography done by Imtiaz Alam Beg, speaks of human emotions which every other listener can relate to. It will remind you of your long lost love or even the best friend with whom you have not been in touch with for a long time.